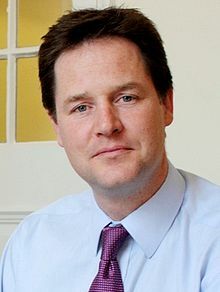 Below is the text of the speech made by Nick Clegg, the leader of the Liberal Democrats and Deputy Prime Minister, on 10th February 2014. A lot has happened since I spoke here last February. At that time, critics of the government’s economic strategy were still clamouring for a Plan B. Around the country you could feel a growing restlessness as people wondered when, if, things would get better. And, in government, we just had to hold our nerve. Today, a year later, it’s clear that was the right decision. Growth is back, unemployment down, 1.6 million jobs created in the private sector, the deficit reduced by a third, confidence returning. There is a lot more to do, but Britain is now firmly on the road to health. My party takes a lot of pride in that, we know there are people out there who didn’t think we had it in us. But we entered coalition precisely to provide the stable government needed to fix the economy. And, without the choice the Liberal Democrats took in May 2010 to secure that stability, Britain would not have the steady recovery, rising employment and shrinking fiscal deficit we now enjoy. We also made sure that the Coalition’s economic strategy is about more than deficit reduction. Sorting out the nation’s finances is essential, but just as important is investing in the things that drive growth. That’s why, despite all of the difficult savings we have had to make, we have still invested in record numbers of apprenticeships; a £3.2bn Regional Growth Fund; the world’s first Green Investment Bank, pioneered by Vince Cable, and we’re investing more in infrastructure as a share of GDP over this decade than under the whole period of the last government. The Liberal Democrats also understand that it isn’t government that creates jobs and growth, it’s the businesses and investors of Britain who do that. Our task is to create the right conditions for you to power our economy forward. That’s why we stuck to our joint coalition plan, despite considerable political pressure to change course. And we are doing everything we can to protect British trade as the country’s most, you might argue only, properly internationalist party. As we head towards the European elections in May we will continue to make the case for Britain’s membership of the EU – our biggest export market – for the sake of prosperity and jobs. For all these reasons there would be no sustained recovery without the Liberal Democrats. We have finally been given the chance to show that Britain’s economy can be trusted in our hands. We are not complacent. The trauma in our banking system at the end of the Labour years was profound, much worse than anyone realised at the time. Our continued progress must not be taken for granted, there is still a long way to go; this will not be a one-parliament job. So my message to you tonight, as Britain’s business leaders, is this: the Liberal Democrats want to finish the job we’ve started and we want the chance to finish it in a way that is responsible and fair. That begins, of course, with completing the task of balancing the books. Sound public finances will not, alone, deliver growth, but they are the foundation on which everything else is built. This is taking longer than the Coalition had hoped, and we’ve been very open about that, extending the timetable was the right thing to do. In the Autumn Statement we set out a plan to get debt falling as a proportion of GDP by 2016/17 and to get the current structural deficit in balance a year later. That is the right timescale and the one to which the Liberal Democrats remain absolutely committed. If I am in government again, this is the plan I want us to stick to. Ed Balls has now confirmed that Labour think they can put all this off until the end of the next parliament. Borrowing more, piling on more debt, diminishing the confidence of our creditors. But it’s reckless and it threatens the stability that’s been achieved. Ed Miliband keeps promising a recovery for all. But there will be no recovery at all if you won’t see through the difficult decisions and get the job done. The Conservatives, on the other hand, agree we need to finish what we’ve started, but they will not do that in a way that is fair. To hold our country together in these difficult times, it is essential that everyone makes a fair contribution. But the Conservative Party has ruled out asking the very wealthy to pay even just a bit more in tax to help the ongoing fiscal effort. Instead they are going to find all of the necessary savings over and above Whitehall cuts by reducing the support we give to the working age poor. The Conservatives have made a deliberate decision that this one group – the working age poor – should be singled out for especially tough sacrifices. When George Osborne says he wants to take a further £12 billion from the welfare budget, that’s actually who he’s talking about. He’s not talking about taking away the universal benefits enjoyed by the very rich, the free TV licences handed out to very wealthy older people. He’s talking about the people scraping by on the minimum wage, the jobseekers who’ve found themselves temporarily down on their luck, the men and women trying to earn their way out of poverty, often working more than one job. Of course we need to get welfare spending at sensible levels. But not through an assault on the hardworking people we should be helping stand on their own two feet. By contrast, the Liberal Democrats will continue to rely on a mix of tax and spending measures to fill the black hole in our finances, just as we have in this Coalition Government. The Conservatives have decided to break with the approach they have signed up to in government with us in order to pursue spending cuts alone, but I believe, as do most mainstream economists, that a mix of tax and spending measures is the most economically and socially responsible way to proceed. That’s why, for example, my party will continue to advocate a small levy on properties worth over £2 million. At the same time, the Liberal Democrats want to keep cutting income tax for ordinary taxpayers. That will be the main item Danny and I push for in the Budget again. In the next parliament we would raise the personal allowance so that no one pays any income tax on the first £12,500 they earn. It’s our flagship policy because it’s how we make work pay, and it’s our way of making sure the British people know that this recovery is theirs. So, unlike Labour we’ll finish the job. Unlike the Conservatives we’ll finish it fairly. What then? My party will be agreeing our manifesto over the coming months. I’m not going to pre-empt that process, we’ll set out our fiscal position in detail in due course. But I can tell you that, as we agree it, we’ll have two big objectives in mind. The first is delivering decent, high quality public services while maintaining control of state spending. After nearly a decade of austerity this will be one of the biggest challenges for the next government. We need to start having a proper debate about how we do it. At the moment all we’re getting from left and right is the same, familiar argument about the size of the state. On the left we have the prospect of an unaffordable, bloated state built on irresponsible borrowing, unsustainable debt, spending for spending’s sake. On the right, talk of an ever shrinking state, in other words cuts for cuts’ sake. And both are, in my view, putting ideology ahead of good sense. When we have finally sorted out our public finances, why would we suddenly start spending money in a way we can’t afford? Equally, after years of reining in spending, why would we be remorseless and dogmatic about further cuts? What Britain will need is a carefully calibrated approach, government living within its means, while still providing the services people need – first class schools, top quality healthcare, a modern transport system, more homes. And, once we’ve completed the fiscal consolidation and the economy is growing, the services the nation relies on should benefit from that growth. I expect the best way to do this will be broadly to maintain the share of our nation’s wealth used to deliver public services and investment. Once we are paying our way as a country again, the resources we apply to our common good should grow as the economy grows. Our second objective must be to get debt down to sensible levels as a share of GDP. This issue is going to present a particular challenge to progressive politicians. There will be a temptation, once the structural deficit has been dealt with, to revert to pre-crash assumptions about debt. That is clearly where the Labour party is. In fact, they seem to want to go back to their bad old ways without even dealing with the deficit first. But this is a very dangerous reflex, for one big, simple reason, when we emerge from this crisis, our debt will be twice as high as when we went in. By the middle of the next parliament, it will be over £1.5 trillion – almost 80% of GDP. Some people say that’s ok we can afford the interest, we dealt with high debts after both of the wars, we can do it again now, but that argument doesn’t hold anymore. Think of the world we are living in today, gone is the time when we were one of a very small number of dominant players in the world economy. Increasingly our debt is held by overseas and institutional investors in an evermore competitive global environment. Britain simply cannot rely on servicing very high debts as easily as we have done in the past. We’re already spending a huge amount on servicing our debts. By 2015/16, debt interest will be our third biggest item of annual spending, after social security and the NHS. To put that in context, for that money you could build around 6,000 new schools, or increase the NHS’s budget by more than a half. We are also an ageing population. It is good news that we can all expect to live longer, but it will come at a price to future generations. The costs of health, social care, pensions are forecast to rise inexorably over the next 50 years. Without policy action, by 2062 the OBR expect our debt to hit 99% of GDP. If we leave today’s debts as they are, those future pressures will be unbearable. And, if we hand over high levels of indebtedness to our children and grandchildren, all we will do is leave them more vulnerable to inevitable future shocks. I hope no politician in this country will ever again claim to have ‘ended boom and bust.’ In an interdependent global economy downturns are inevitable. And if we go into another recession with a high debt to GDP ratio it will be much harder for us to keep the confidence of creditors, to keep the cost of borrowing down. And, as any good Keynesian will tell you, our ability to stimulate our economy will be massively reduced. How can any progressive advocate that? As we have seen in other European countries, when a country loses control of its finances it is the poorest who suffer most. The job of progressives is to shape the world as it is, not as it was or as we would like it to be. And the Labour party needs to recognise the way the world has changed. In an era of globalisation, integrated financial markets, when we are just emerging from the biggest economic crisis since the Great Depression and facing huge demographic challenges, we must be alive to the danger of persistently high levels of debt. Yes we will need to invest, my party and I have already committed in the next parliament to keep investing in the country’s productive infrastructure for the sake of our long-term well-being. But it must not come at the expense of our long-term stability. Investing to drive future prosperity must be coupled with sustainable finances – and that’s the balance we will strike. The Liberal Democrats will plot a course which safeguards investment, which protects future generations from future shocks and which ensures that, instead of spending more and more of our money on servicing the interest payments set by international bond traders, we spend it on the support and services the British people need. For these reasons, in fifteen months I want us to get into government again to finish the job we’ve started, to finish it fairly and, as we head towards the next stage of our recovery, to protect the progress that has been so hard won. Tonight I hope to leave you knowing that you can rely on us. I want you to know that the Liberal Democrats are a party of business precisely because we can be trusted with Britain’s recovery. And because we are determined to build a strong and resilient economy in which Britain’s firms can flourish. Over the coming years I want us to do that together. I want the nation to come out of this crisis better, stronger than when we went in. And every day that I am in government, that is what I will strive to deliver.